For me, this country means the Lord of the Rings since the trilogy was filmed there. It was just like an outrages adventure. My friend and I booked the ticket not more than 2 months earlier, applied for the visa and then almost forget about it due to assignment and exam period! So, there we go! Nov 22nd, 2011 was our departure date. Qantas took us to Melbourne and then Auckland. Touch down in the biggest city in NZ in the afternoon, it reminded us of Adelaide. The city with about 1.3 million population was very quiet and beautiful. But it was also a cold spring for us who landed from sunny Adelaide. We headed to Weymouth, almost 20km from Auckland CBD, to meet my CS friend and spent 4 nights there. At the same time, there was a couple from French who spent 2 nights there as well. Thus, they got a room while we got a lounge. Not bad at all. The next morning, we traveled to the city. The bus/train fare is quite expensive there. It's based on stages; each stage is approx. 5 km. So, we bought a daily ticket for NZD 15. The ticket was valid for bus, train and ferry to Davenport (or Devonport … yaaa whatever lah!). We catch the bus from Britomart Train Station to our first destination. It was the famous Mission Bay. I had no idea what is it famous for. Compare to Glenelg in Adelaide Suburban, I love Glenelg more. But hey, it was an adventure. We walked along the beach for a while. FYI, there is a café named Mecca in Mission Bay. Then, we walked up hill to see the Mission Bay neighborhood. Wow, this area is such a great place to live. Those houses were nice, the surrounding was quiet, and the view was spectacular. After enjoying those luxury houses, we walked down the hill. Following an NZ friend suggestion, we bought ‘Movenpick’ ice cream. Delicious ice cream and the bay view were absolutely brilliant idea to enjoy a chilly-sunny afternoon. We got back to the city to catch a ferry to Davenport. It was 15 minutes sailing before we reached another quiet but beautiful area, Davenport. 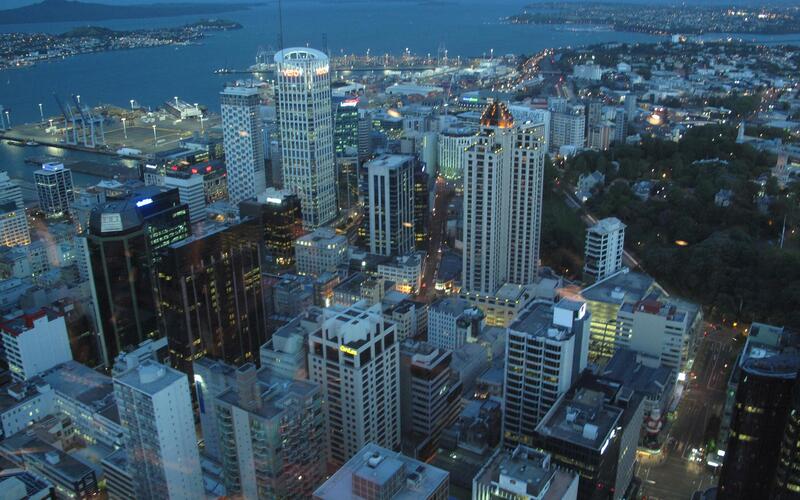 From here, we could see Auckland downtown and its skyscrapers including the Sky City Tower which is the highest building in the southern hemisphere. Just don’t forget to visit a chocolate factory here. When we walked in the shop, the smell of chocolate was a temptation for our empty stomach. We got one small bar of free chocolate. We didn’t buy anything, so we just hanging around another part of Davenport. In contrast to Adelaide where mostly the road is flat, here almost everything is hilly. So, it was exhausted to go around the city by foot. Auckland ... A view from Davenport! 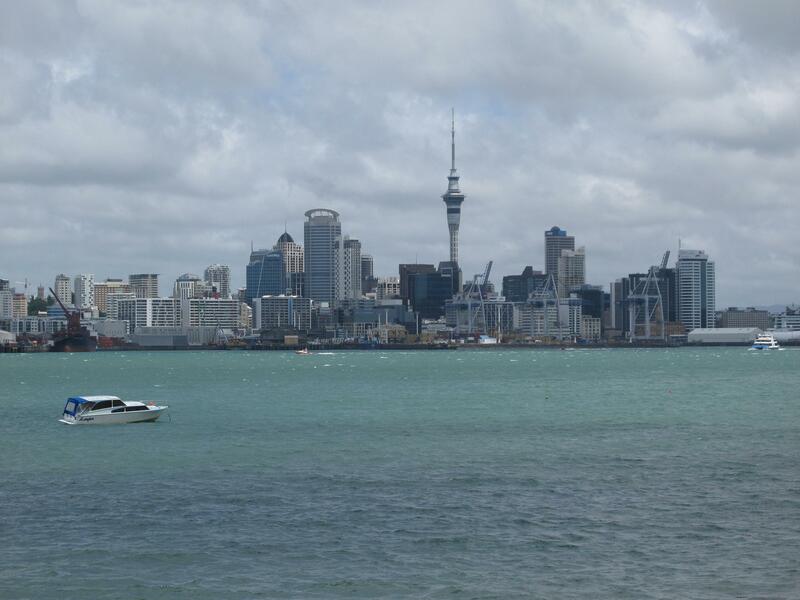 In the afternoon, we catch a ferry back to Auckland. We haven’t seen the city very much. The main road is Queen St., it lays across from the Ferry Building up the hill to the Auckland town Hall. There are some Halal food counters along the street. 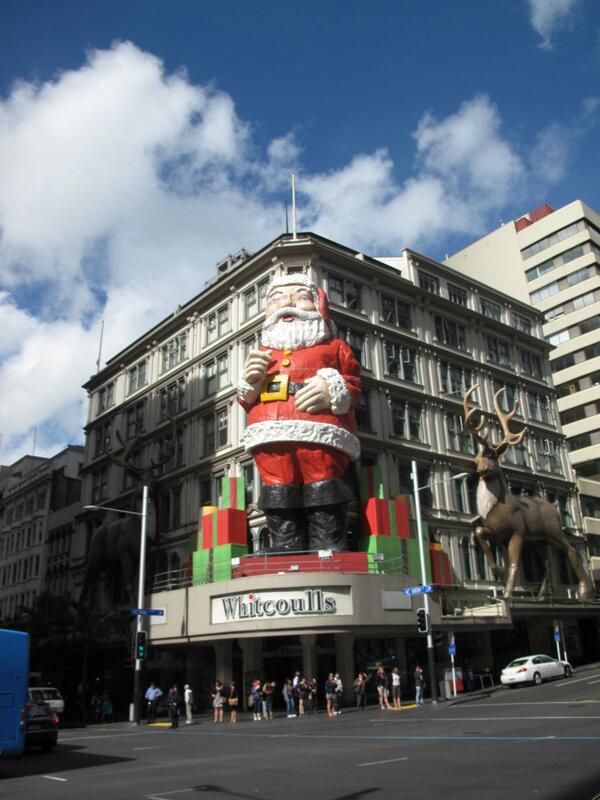 Corner of Queen St. ... Santa is coming to town! And then, coffee time! (Hot chocolate for me since I’m not a coffee person). Queen St. No. 1 Café offered various menus with free wi-fi and direct view to historical Ferry Building, elegant Britomart Train Station and shopping centre as the background. I think I’m falling in love with Auckland, the same feeling when I was falling in love with Berlin (and Bandung of course, my lovely hometown!). Up next was our last destination for that day. 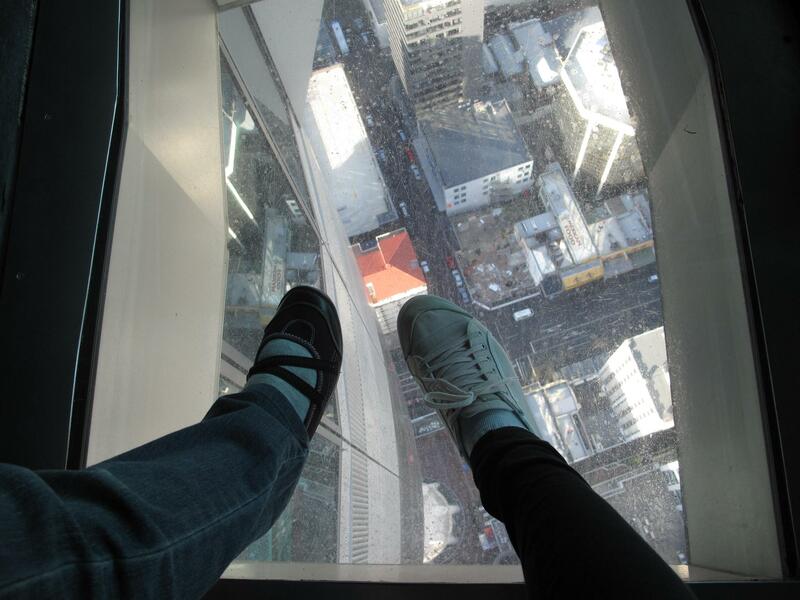 That was the highest building in the Southern Hemisphere, Sky City Tower. It is walking distance from the train station. However, we choose to catch the free bus (the color of the bus is gorgeous red!) since the road is hilly. 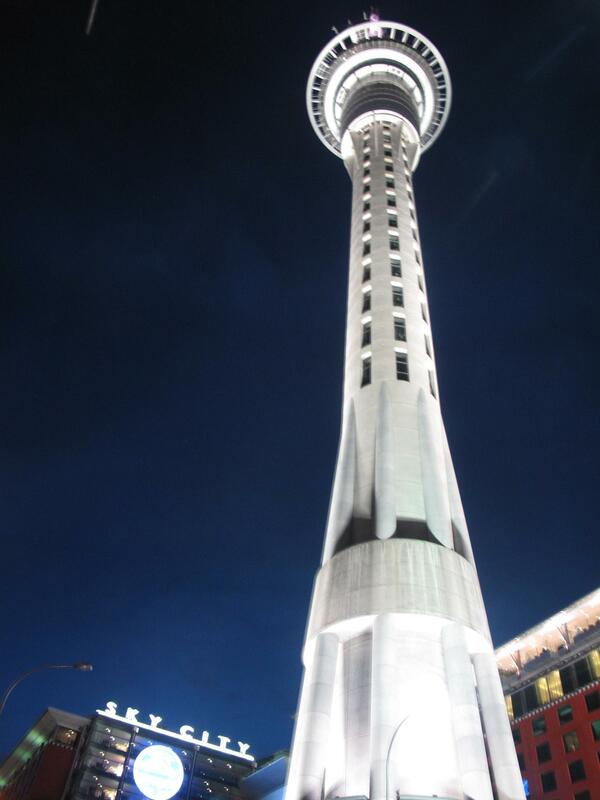 Public admission fee to Sky Tower is $28 but because the two of us are students, so we only had to pay $18 (enjoy student concession!). In the front area of the tower, there’s a souvenir shop with memorabilia from the Lord of the Rings and Avatar. Don’t forget to take a picture with Gollum or Uruk Hai or that Blue Creature from Avatar. There’s also hobbit cloak, the price is over $1000!! Finishing photo session with all creatures, we headed to the lift that took us to the third highest level. There’s also a café up there. The ticket was also valid for the highest level of the tower. What a view! Some parts of the concrete floor was replaced by thick glasses, so it seems that we walked in the air :P. Actually, I really wanted to do a sky jump (similar to bungy jumping) but it was very very expensive (more than $100). And we arrived in the tower after 6 p.m. and the sky jump booth has already closed at the moment :D.
So, we just sat there, enjoyed the view … waiting for the sunset and looking down the street when city lights start shining. Forget my thesis for a while … lovely! boleh tekar link ga ya..??? ?